Developing an app can be a very exciting process, but at the same time you may be struggling to figure out how your app will produce income. The app market is a very competitive place, so the revenue model you choose will have a huge impact on how many downloads your app gets and of course how much revenue you will generate. In this post, I will describe your options while providing some stats about each approach. The goal is to help you make a more informed decision when picking your revenue model. The first and most straightforward way to make money from an app is to charge each time someone downloads it. It’s no secret that there is big money to be made on app downloads. Of course, it’s not easy to convince your target audience to invest the money to buy your app, especially when there are so many out there that are free. This monetization method requires great planning, execution, and marketing. For example, choosing how much to sell the app for can influence your success greatly. App store revenue is not directly correlated to app price, therefore you must select an appropriate price for your app and category (1). 70% of all current revenue generated comes from paid downloads. However it is predicted thatnIn-App Revenues (“In-app purchases”) will rise to account for 48 percent of all revenues by 2017 (2). It is important to select the right freemium technique to match your app’s function and user base. In general, only a small percentage (1% — 5%) of an app’s audience will ever pay for special features or upgrade to a paid app. Because of this, commercial success requires a fairly large audience, especially because the prices charged for in-app purchases are often relatively small. It is important to structure your freemium app to target users who make repeated purchases. The top grossing apps generate 71% of their revenue from in app purchases (3). This is a few years ahead of Gartner’s report, which projects that IAP will only overtake paid download sales in 2017. Similarly, freemium is more prevalent and outperforms other app store monetization models (1). Both Freemium and In-App Advertising (see below) give you the opportunity to cast a wider net and better monetize in the long-run through potentially more consistent revenue streams. 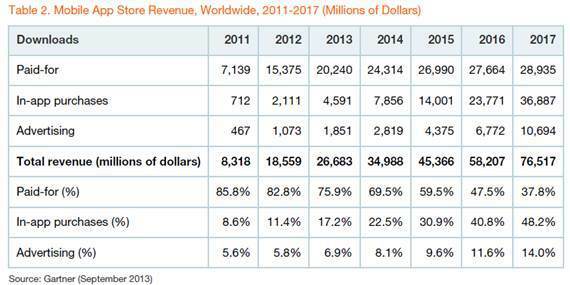 In contrast, paid revenue shrank from 2012 to 2013 (1). Profits can be made from ads within your application, similar to websites. This profit can vary, as it depends on the amount of views and number of clicks. There’s still a major opportunity here for apps that receive a high number of pageviews or that offer access to a desirable and targeted audience. Apps need usage to generate advertising impressions, which is where downloads, engagement and user retention play a critical role. Banner: A mobile banner ad works the same way as a banner ad on a website. Interstitial: Generally an ad that takes up the entire screen (as opposed to a banner that appears alongside the app’s content). Ads provide a major monetization opportunity in which you’ll be relying on your users to engage with the ads to drive revenue. The most popular apps can make over $100K per month while developers in the 75th to 90th percentile can make up to $10K per month (1). The most predictable mobile advertising revenue will generally come from an exclusive sponsor – an advertiser who wants their messaging to be displayed whenever someone uses your app. Finding advertisers may be difficult on your own, which is why using a mobile ad network can be a great option. Partnering with an ad network can provide a more immediate and less involved route. These networks will sell your ad inventory for you and take a portion of the total revenue in exchange for their services. Lastly, selecting the mobile app business model that ﬁts the target region is paramount. India and the United States lean towards in-app advertising, while Japan, Brazil and Russia lean towards app store revenue (1). So there you have it! Three different ways to generate revenue from your mobile app. You may choose to use a combination of these or only one. When deciding which model may work best for your situation, it is important to understand well the purpose of your app including its target audience.